Today was my best day yet. I am starting to get really comfortable with procedure and the caves themselves. It was hard to imagine being that far away from breathing air at first, but its getting better. 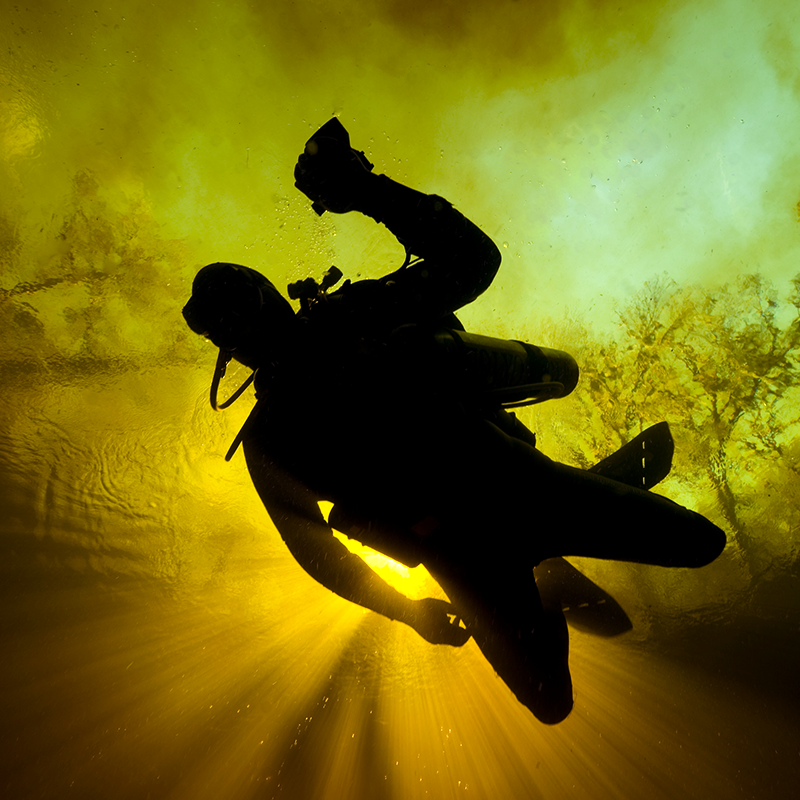 We went to the Chac Mol cenote to wrap up the Intro to Cave Diving portion of the course. 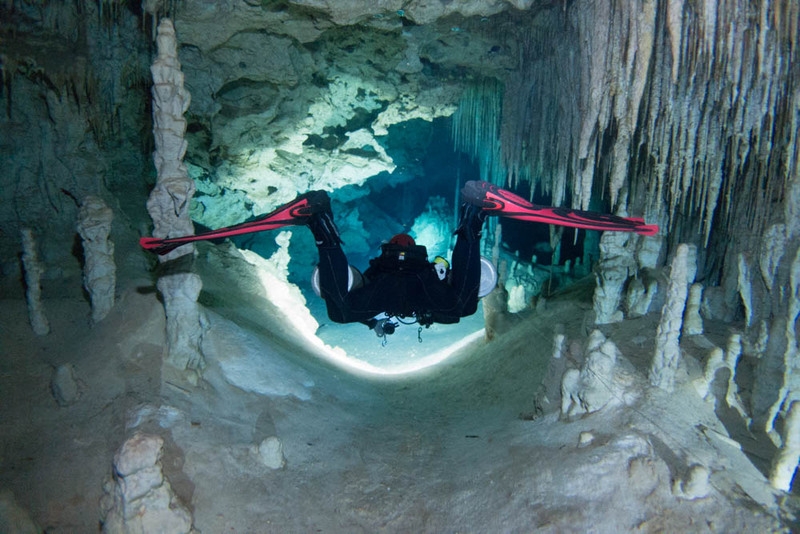 It must be cave season in Playa because there was a bunch of divers at the cenote again today. We had to wait a couple of hours to get in because there were so many divers. After all the normal checks, we descended into the cenote. Nando decided he was going to play the role of “ghost”, but he behaved nothing like Casper. The ghost’s role is to cause equipment failure, turn off lights, steal gear, stress me out, shut down valves, all without being seen, and Nando is very, very good at it. Inside the cave, I could only see what was directly in front of my light, giving Nando plenty of opportunities to do his evil job. We got onto the cave’s main line a lot quicker today so I felt really good at first. 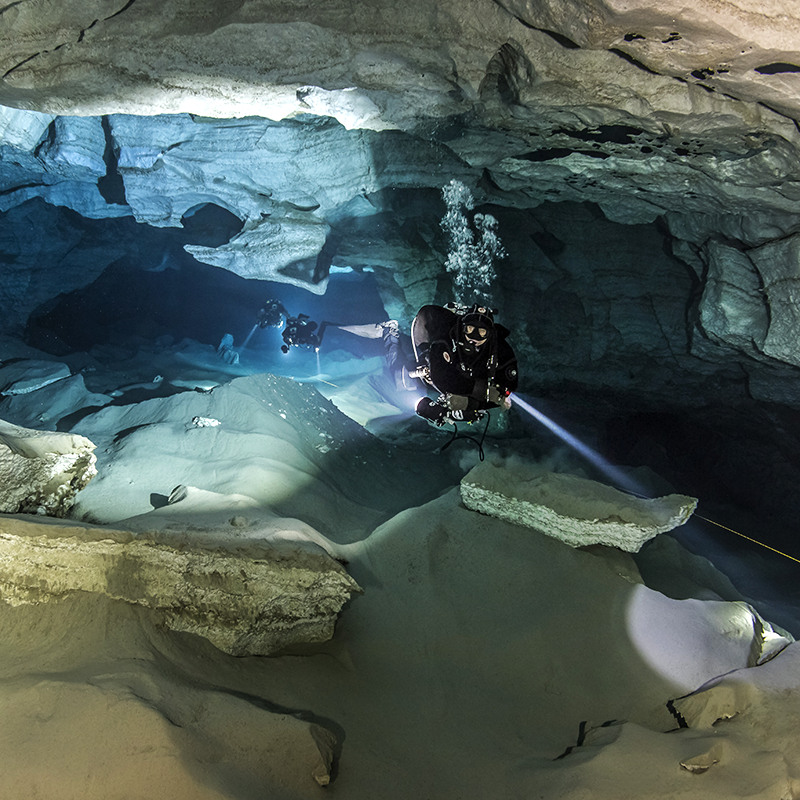 It is a strange cave because the main line runs right along the halocline at 12m/40 ft. The halocline is a very thin plane where the fresh water (which is on top) meets the salt water below. It is very cool to look at. If you are above it, it reflects the cave’s ceiling. When you drop below it the water gets warmer and you can feel the salt on your lips. Haloclines completely screw up your buoyancy because the salt water is much denser making it hard to swim through it. If you don’t compensate right, you can get “glued” to the halocline because you float in the salt water but sink in the fresh. It feels really weird! Another negative thing about the halocline is that you can never swim behind someone if you want to see anything. When your fins make the fresh and salt waters mix, the visibility gets really bad. It’s like trying to read the newspaper through a clear bag that is full of water after drinking 20 tequilas. Pete Bucknell poses for a creepy shot in the open water area of Cenote Car Wash in Tulum. No filter in the picture. The yellow and orange tint in the image is caused by the tanins in the water. This cave had a lot of up and down passages. At one point during the dive, my computer only read a depth of 5m/15 feet. I then realized that the surface was so close, but so far away. Anyway, Nando took advantage of every chance he got to mess with me. He swam in front of me a million times to make the visibility go bad. Once we turned around to head out, I suddenly ran out of air (not really but….remember Casper?). I quickly signaled my teammate who gave me his spare regulator and then we had to swim out of the cave very close to each other as fast as possible without overdoing it. It actually wasn’t that bad. On the second dive, everything was pretty easy until the turn around point. My teammate was about 20 feet from me when he started waving his light around like a crazy person. That means EMERGENCY and it usually means “out of air”. I only got a chance to kick once when his light went out. Now I have to find my teammate who has no light and no air. I still had my light on but it is still really hard to see anything you are not pointing your light at since the beams are so tight. Nando made it even harder by moving his fins in front of my face to stir up the halocline (that’s why he picked this dive site!) I eventually found Mauro and gave him my alternate. Just when I was getting the situation under control, my light was out and, once again, we had to find our way out of the cave in complete darkness but this time we were sharing one air source. I tucked in under Mauro’s armpit and gave him the signal to move. We started heading towards the exit at an incredible speed. When I tucked under his arm, Mauro and I became one diver with four fins. We were moving really fast. This was all good except that every once in a while, the cave’s main line is tied to a rock. That means that your hand crashes into really sharp rocks all the time. My hands look like Brad Pitt’s in Fight Club. During our swim out, Nando tried to mess with us by pulling the line out of our hands but he couldn’t because we were grabbing it correctly. After that, we swam so fast he couldn’t keep up! I was really proud of myself. After an 8 minute swim, we finally made it out to open water to end the dive. Seeing light was an amazing feeling. Tomorrow is supposed to be the hardest day of the course. We are going “fishing” which means I have to lose the cave’s main line in a huge room, and then I have to try to find it with no lights. YAY! Sorry I didn’t write yesterday but I was asleep at 6 pm. It is hard to understand why I am so tired after these dives. I don’t really do much physically and I feel pretty relaxed during the dives. I guess my adrenaline is pumping more than I think. I learned more today than on all the other days combined. We went to the “House of Pain” cenote. We had about 3 hours of theory before we got in the water. Nando had me practice finding a lost line and a lost teammate on land with my eyes closed. Finding the line was not extremely difficult and only took me 20 minutes (hehe). Finding a lost person was impossible. 3 divers posing for a picture inside a cave in Tulum. Playing Hansel and Gretel in a cave. During the first dive, Nando let me do my first “jumps”. You do jump when a line that is already set inside the cave is NOT connected to another line that’s inside the cave. Since you always dive on a continuous line, you have to connect them. Sounds easy, right? WRONG! It’s really hard to find the second line. Once I did find it, I had to make sure I marked my “jump” line so that when I returned I could turn the correct way and follow it out. We did three more jumps after the first one. Once we got to our turn around point, I was really surprised when my light turned off. This time it wasn’t Nando’s doing as my light actually failed!! Of course, Nando is not one to pass up an opportunity like this so he did not let me turn on my backup light. Now I had to find my way out of the cave in complete darkness through complex navigation. What I did not know was that Nando had put up fake jumps behind me. This means that there were lines on my way out that did not lead anywhere. If I followed any of them, I was dead. Each time I reached a decision point (a place where a line branches off into more than 1 line) I had to feel the markers to make sure they were mine. The 4 jumps resulted in 16 different ends. Only 1 of them was correct. It took me forever, but I was able to feel all of my markers and get out of the cave alive. The funny thing is that when I got out, I was alone. Nando and Mauro had stayed behind picking up all the reels I left behind. I am sure he was watching me the entire time, but it was a weird feeling to think that I was in the cenote by myself. The second dive was much shorter. We went into the cave without any complex navigation. It was as simple as following the main line. A few minutes after we turned around, Nando took me about 10 – 15 meters off the main line to “show me something”. I knew exactly what he was up to. Once I got there with him, he turned off all the lights. Now I am 10 – 15 meters from the line and I have to find it and get out in the dark. This exercise really frustrated me. I cut my head, hands, and wetsuit trying to find the line. After about 5 minutes of searching I found it! Now decision time, which way do I go?? It’s hard to know but you just have to make an informed decision and go with it. If you make the wrong one, you will eventually find out. Hopefully, it wont be too late. Luckily, I made the right choice and found the exit.